Boasting some of the most famous monuments on Earth, San Francisco is the cultural and commercial heart of Northern California. Situated on the Pacific Coast, San Francisco is the 13th most populous city in the entire United States and the 4th most populous in California. It's known as one of the richest and most progressive cities in America and covers an area of approximately 231.89 square miles. 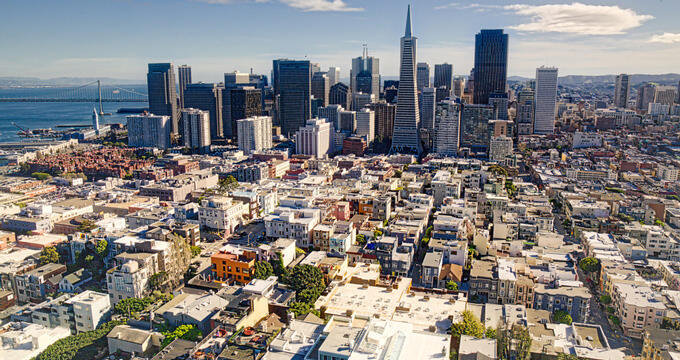 Around 885,000 people live in San Francisco, with over 4.7 million in the surrounding metropolitan area. The area was first settled in March of 1776 by Spanish explorers, who constructed what would go on to become the Presidio district of San Francisco. The area was under Spanish rule for some time before becoming part of Mexico in 1821. California was claimed as part of the United States in the wake of the Mexican-American War and the town, which was named Yerba Buena at the time, was given its new name of San Francisco. The city grew and grew over the years, especially during the time of the California Gold Rush. The beautiful waters of San Francisco's Bay Area attracted many residents and businesses, and iconic landmarks like the Golden Gate Bridge and Alcatraz prison were constructed to symbolize the city's growing stature. The city was hit by a terrible earthquake in 1906 but came back stronger than before, proving to be a hotbed of social and cultural change and developments. Filmmaking, music, technology, and more have all witness enormous growth in San Francisco and the city is regarded as a global leader in social progression. Elevation is a term used to measure the height of a city or other location in relation to the mean sea level of Earth and can be very important and influential in a variety of ways. Cities at lower elevations, for example, tend to have warmer weather in general. The elevation of San Francisco is very low, averaging out at 52 feet (16 m), but the city is famously built on a lot of hills, so elevation can greatly vary in San Francisco from one spot to the next. The highest spot in San Francisco has an elevation of 934 feet (285 m), while the city's lowest elevation is the waters of San Francisco Bay and the Pacific Ocean, which are at sea level. Just like the city of San Francisco, the elevation around California can vary greatly in different parts of the state due to its various landscapes and mountain ranges, along with its long coastline. The mean elevation in the state of California is 2,900 feet (880 m), which means it is the 11th highest state in terms of mean elevation. Compared against the state average, San Francisco’s elevation is very low, but the lowest point in the entire state is Badwater Basin, which also happens to be the lowest point in the country and has an elevation of 279 feet (85 m) below sea level. The highest point in California is Mount Whitney with an elevation of 14,505 feet (4,421 m). Other major cities around the state of California include Los Angeles, which has an elevation of 285 feet (87 m), San Diego, which has an elevation of 62 feet (19 m), the state capital of Sacramento, which has an elevation of 30 feet (9 m), and San Jose, which has an elevation of 82 feet (25 m). The elevation of San Francisco matches closely with many of these other big cities. The city of San Francisco has a Mediterranean climate with warm, dry summers and quite mild winters. The low elevation of the city helps to keep temperatures relatively high and its proximity to the Pacific Ocean also helps to provide steady warmth to the city. It doesn't rain too often in San Francisco, with most of the city's precipitation falling in the colder months of the year from November through to March. Typical summer temperatures can hover around 52°F (11°C), so temperatures are very stable throughout the entire year. San Francisco is a major tourist destination and a very friendly and progressive city, welcoming millions of visitors and residents from around the world. Some of the must-see landmarks in the city include the Golden Gate Bridge, Alamo Square Park, Alcatraz Island, and Pier 39, with the city also boasting dozens of clubs, bars, restaurants, live entertainment venues, and sporting events. Recreational activities in San Francisco include kayaking, hiking, cycling, and surfing.